THACKERAY is the story of the Shiv Sena founder Balasaheb Thackeray. Bal Keshav Thackeray (Nawazuddin Siddiqui) is the eldest son of social reformer Prabodhankar Thackeray and is married to Meenatai (Amrita Rao). The story begins in late 50s when Bal is working in Free Press Journal as a cartoonist in Mumbai. He feels stifled with the restrictions put on him by superiors over attacking certain political figures. Hence, Bal resigns and starts his own political weekly called Marmik. Bal realizes that the South Indians have dominated businesses and offices in Mumbai and look down upon Maharashtrians. Through his cartoons and later his speeches, he begins to inform the sons of soil that they should fight for their rights and not let ‘outsiders’ to take over the reins of Mumbai. His speeches begin to motivate Maharashtrians and they commence the fight for their rights. As his stature and popularity grows and as he begins to be addressed as Balasaheb, he floats his own political party called Shiv Sena, in 1966. The party suffers a lot of ups and downs but slowly makes its mark. In the 80s however, Balasaheb shifts his agenda and becomes pro-Hindutva. The Shiv Sainiks also have a part to play in the demolition of Babri Masjid in 1992, which leads to riots and widespread wave of shock across the country. How Balasaheb tides over this crisis fearlessly and also overcomes other challenges forms the rest of the film. 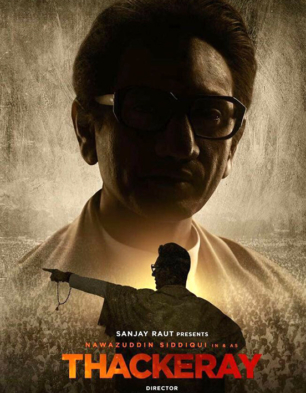 Thackeray (2019) THACKERAY is the story of the Shiv Sena founder Balasaheb Thackeray. Bal Keshav Thackeray (Nawazuddin Siddiqui) is the eldest son of social reformer Prabodhankar Thackeray and is married to Meenatai (Amrita Rao). The story begins in late 50s when Bal is working in Free Press Journal as a cartoonist in Mumbai. He feels stifled with the restrictions put on him by superiors over attacking certain political figures. Hence, Bal resigns and starts his own political weekly called Marmik. Bal realizes that the South Indians have dominated businesses and offices in Mumbai and look down upon Maharashtrians. Through his cartoons and later his speeches, he begins to inform the sons of soil that they should fight for their rights and not let ‘outsiders’ to take over the reins of Mumbai. His speeches begin to motivate Maharashtrians and they commence the fight for their rights. As his stature and popularity grows and as he begins to be addressed as Balasaheb, he floats his own political party called Shiv Sena, in 1966. The party suffers a lot of ups and downs but slowly makes its mark. In the 80s however, Balasaheb shifts his agenda and becomes pro-Hindutva. The Shiv Sainiks also have a part to play in the demolition of Babri Masjid in 1992, which leads to riots and widespread wave of shock across the country. How Balasaheb tides over this crisis fearlessly and also overcomes other challenges forms the rest of the film..
Thankfully, The Makers Do Not Throw In Unneccessary Songs Which Could Have Deviated Your Focus From The.. If You Believe There Are No Excuses For Vandalism And Violence, Then You Would Not Like Thackeray, The..
On The Whole, THACKERAY Is A Well-made And Well-told Biopic About One Of The Most Important Political Figures..
All Said And Done, Thackeray Is An Interesting Journey Of A Person Larger Than Life Portrayed In A Very.. Writer And Producer Sanjay Raut Doesn’t Distort Facts From Bal Thackeray’s Story. The Riled Up Speeches,..
Nawazuddin & Amrita Rao Thackeray..
Thackeray Music Launch Full HD..